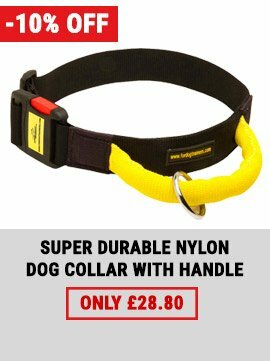 This Staffordshire Bull Terrier muzzle is completely safe and non-toxic. 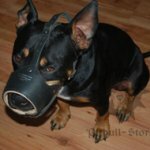 You have to see this Staffy muzzle to believe the craftsmanship and quality. The muzzle for Staffy is padded inside with very soft Nappa leather for maximum comfort and to prevent rubbing. The leather dog muzzle will not stick to Staffordshire Bull Terrier snout in winter. Perfect anti-bark muzzle! Attention! This leather dog muzzle prevents barking only, it doesn't protect from dog biting. 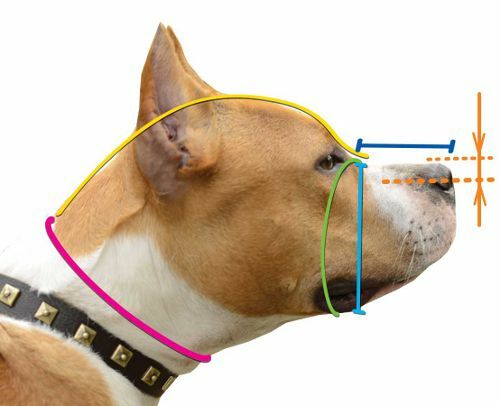 The dog is able to bite with this type of muzzle! If you need an anti-biting muzzle, you should pay attention to our mesh leather model. We should say that the most effectual way to stop your Staffordshire's barking is to train him. The muzzle must allow your furry friend to open his mouth a bit to breath. It also mustn't be too tight for normal circulation of the blood. It means, that if he has a possibility to open his mouth, he has a possibility to bark. Read our article how to stop puppy biting and consult a dog trainer if your dog has more serious behaviour problems. 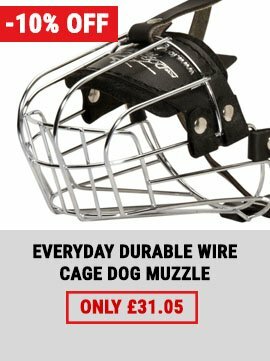 Still aren't sure whether you should buy the Staffy muzzle at our store? 1. Good morning, I received the dog muzzle yesterday. The quality is super. My daughter will come from Berlin the next week. She has an Amstaff. As soon as the dog, Pablo, will put it on I`ll send you the photo. Thank you. Best regards! 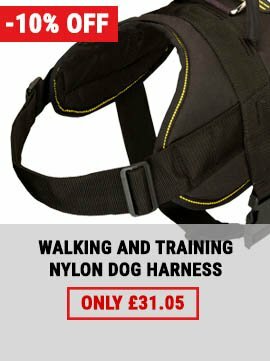 We have also a wide choice of Staffy harnesses for any purpose! Do you want to preserve initial look of your new muzzle? So cover the product with our Leather Care Balsam and enjoy long calm walks. After a long search I found the best!!! Soft leather / multiply adjustment / TOP processing!!! Quick shipping!!! This is my favourite among dog accessories from today!! !